The Polar Star (WAGB-10), America’s sole remaining heavy icebreaker, is approaching her final years of service and it’s not clear when Washington will allocate the necessary money to replace the aging ship. This leaves the United States Coast Guard praying she doesn’t break down, and the country struggling with one of its least-understood and least-addressed national security needs. What is more disturbing is that most lawmakers in Congress don’t see the urgency to build new ones. Commissioned in 1976, Polar Star is more than 40 years old and was supposed to retire 10 years ago. However, the dearth of heavy icebreakers in the Coast Guard’s fleet has forced her to stay active until replacements arrive—whenever that is. Coast Guard Vice Commandant Admiral Charles Michel stressed to the Committee on Polar Icebreaker Cost Assessment on Monday that the service could not guarantee year-round access to the Arctic Circle because its icebreaker fleet is not reliable. The other only heavy icebreaker, the Polar Sea, suffered engine failures in 2010 and can no longer operate. What this means is that if the Polar Star suffers a significant mechanical issue or a major emergency occurs, the Coast Guard may not be able to respond. “If Polar Star were to suffer a casualty, we have zero self rescue capability,” Michel said, according to Compass, the Coast Guard’s official blog. As Foxtrot Alpha recently reported, Russia is dominating the Arctic Circle region with its fleet of 40-plus icebreakers. That’s more than the rest of the world’s fleets combined. Russian President Vladimir Putin sees the region’s oil reserves as a keep economic pool for its extremely energy-dependent GDP. Given that the U.S. and Europe have levied stiff economic sanctions against Moscow for its invasion of Ukraine, Russia is looking for every economic option it can find—even in the subzero Arctic. America doesn’t have as urgent an economic stake in the Arctic as Russia, but it certainly has a geopolitical one. Russia has been militarizing the region for years. If America doesn’t begin to strengthen its presence there, including with icebreakers, it could easily face a situation in which it cannot respond adequately to potential conflicts or emergency situations. The Coast Guard does have a medium icebreaker, the Healy (WAGB-20), which would have no issue cutting through ice around four feet thick at a speed of 3 knots. But it is mainly a research vessel and is not designed to clear channels through ice fields that can get up to 20 feet thick. It is 420 feet long and weighs 16,000 tons. The ship is designed to hold a team of 35 researchers, 15 surge personnel and two visitors. The Polar Star, set to retire no later than 2022, is the lone mule in the dwindling fleet. She can break through ice up to six thick deep at a speed of three knots. It’s 399 feet long and weighs 13,200 tons. It can embark on a research mission with 32 researchers and a crew of 134. None of America’s icebreakers are nuclear, which is the norm for these modern ships. A 2016 Congressional Research Service report called for six new icebreakers, three medium and three heavy, in order to carry out mission needs. At one point, the Coast Guard had as many as eight icebreakers before they started breaking down over the years. If Congress doesn’t allocate funds for new heavy icebreakers before 2020, the country could see itself without a vessel that can clear channels in the Arctic. It also means McMurdo research station would be without its main resupply ship. That would be an embarrassing predicament for a U.S. that is vying for geopolitical positioning in the region, where possibly 90 billion barrels of untapped oil and 1,669 trillion cubic feet of gas is situated, according to Visual Capitalist. Icebreakers play a very critical role in clearly pathways for exploration to access these natural resources, so investing in more of them will be critical. There are a lot of reasons why funding has been slow to come. 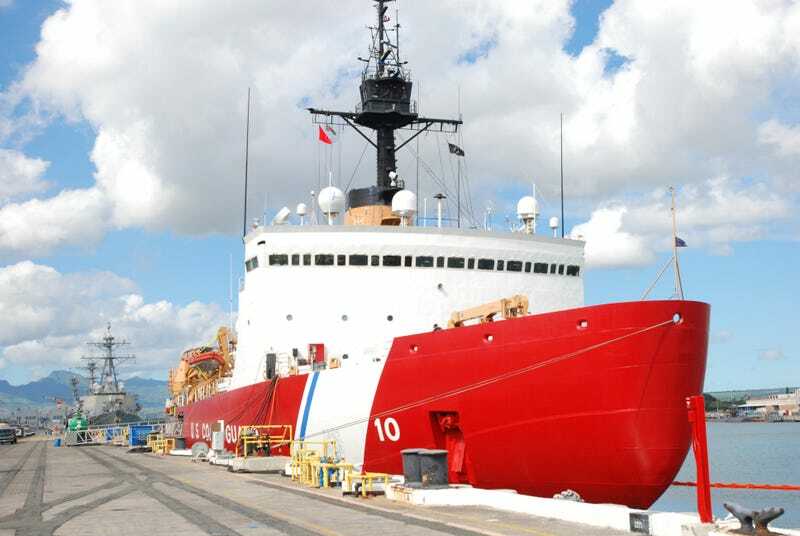 Rep. Duncan Hunter (R-California) chairman of the House subcommittee on the Coast Guard, accused the Coast Guard of not asking for the six icebreakers it needs, according to Defense News. But Hunter has also argued that it could be a military culture issue that tends to look at the Coast Guard as a stepchild that doesn’t get the same respect as other services when it comes to annual funding. Former President Barack Obama was well aware of the icebreaker shortfall in 2015 when he called for funding to fill the void. Still, little movement has taken place to actually buy any. On Monday, the U.S. Coast Guard proudly posted a video on its Instagram of the Polar Star clearing a 70-mile ice field to reach McMurdo Station, where the U.S. Antarctic research center is based. “Polar Star is crushing it,” the description reads next to video of the icebreaker making its way through the thick polar ice. The service better enjoy such moments while they can, because it is not known how long she can hold up.